Andrew McCutchen hit his first home run of the season, Jonathon Niesefired seven scoreless innings and the Pirates ended a four-game losing streak with a 5-0 win over the Brewers -- the Bucs' first shutout of the season -- on Saturday night at PNC Park. In the longest start by a Pirates pitcher this season, Niese put the ball on the ground -- 14 of his 21 outs came via ground balls -- and let his defense go to work. 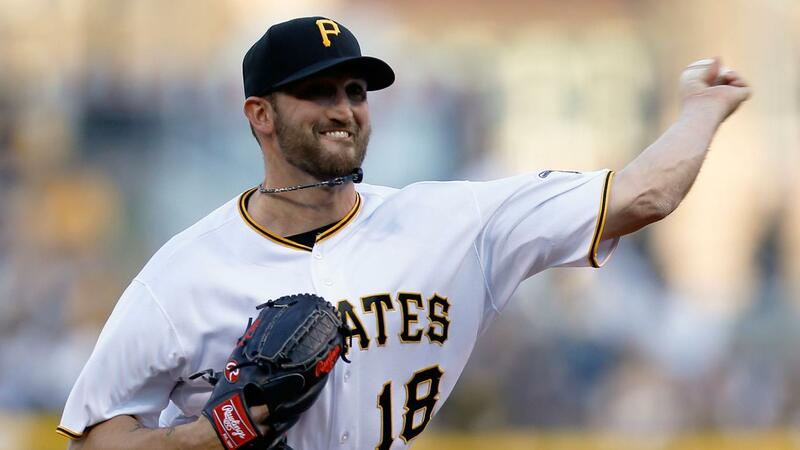 Pittsburgh's entire infield shined behind Niese, converting those grounders into outs with remarkable efficiency. "Just pounded the zone with all my pitches," Niese said. "They're outstanding back there, as you could see today. They did a heck of a job." The Bucs cobbled together three runs in the fourth inning, and McCutchen delivered a big blow in the fifth. McCutchen turned on a 75-mph curveball from Brewers starter Taylor Jungmann and launched it 401 feet to left field. Setup man Tony Watson and closer Mark Melancon finished the game for the Pirates, who had lost six of their last seven games before Saturday. "It was a good game," Pirates manager Clint Hurdle said. "I thought we were crisp all over the place." Jungmann, who went 3-0 with a 2.42 ERA in four starts against the Pirates last season, allowed four runs on six hits and struck out six over six innings. The Brewers' best chance to break through against Niese came in the fifth inning, but the Pirates' infield -- particularly shortstop Jordy Mercer and third baseman David Freese -- helped Niese thwart Milwaukee's rally. Crooked number: The last few days, the Pirates had been desperately seeking an inning like the fourth. Starling Marte led off with a double, Francisco Cervelli reached on an infield single and Gregory Polanco drove home Marte with a productive groundout to first base. Up came Josh Harrison, who slammed an RBI triple off the right-field wall. Mercer followed with a sacrifice fly to left, and just like that, the Pirates had quickly established a three-run lead. Threat extinguished: The Brewers mounted a mild threat in the fifth inning, but with runners on second and third and two outs, Niese got Domingo Santana to ground out to third, ending the threat. "I'm getting there. Twelve games into the season, hopefully just keep it going," McCutchen said. "Once I really get it, hopefully I can stay there and maintain it." • Pirates first baseman John Jaso extended his hitting streak to seven games and has reached safely in each of his 11 games this season. • Brewers second baseman Scooter Gennett drew his ninth walk of the season. He was issued only 12 free passes all of last season. After the game, the Brewers officially called up right-hander Zach Davies, who will start Sunday's series finale. Milwaukee sent outfielder Keon Broxton to Triple-A Colorado Springs. Broxton was 0-for-16 to open the season. He will get a chance to play on a regular basis at Triple-A. Brewers: Davies was recalled to start Sunday's rubber match at 12:35 CT. In two starts at Triple-A Colorado Springs, Davies was 0-0 with a 2.00 ERA. He is 0-1 with a 11.25 ERA in two career starts against Pittsburgh. Pirates: Right-hander Juan Nicasio will start at 1:35 ET Sunday at PNC Park. In Nicasio's first two outings, the Pirates saw both the dominant pitcher who earned a rotation spot this spring and the inconsistent starter who often struggled with the Rockies. He is 2-0 with a 1.20 ERA in four career appearances, including two starts, against Milwaukee.